The Honeycutters are thrilled to be performing two evenings this May in their hometown of Asheville, NC at Isis Music Hall. Tickets are $12 in advance / $15 at door for each night. The Friday, May 17th concert will be a seated event with Rorey Carroll opening the show. The Saturday, May 18th concert will be a standing room only (minimal seating on the concert floor and in the balcony) show with Moses Atwood and his band opening the show. The Honeycutters are, at the heart, the musical collaboration of singer/songwriter Amanda Anne Platt and lead guitarist/ producer Peter James. While their sound has drawn comparisons to such artists as Gram Parsons and Emmylou Harris or Gillian Welch and David Rawlings, Platt and James produce a refreshingly unique blend of Americana music that is comfortingly familiar while being entirely original. Like so many of country music’s great duos, Platt and James have a musical chemistry that can be felt throughout the songs they play, from the sounds of their guitars to their vocal harmonies. Perhaps this is why they are frequently mentioned along with the movement to “take country music back to its roots.” Tal Taylor on mandolin, Rick Cooper on bass, and Josh Milligan on drums round out Platt’s songs and create a sound that carries just as well across the bar room as it does in a church or a music hall. The Honeycutters launched a Kickstarter campaign over MerleFest weekend, where they performed, and it will run for forty days. The goal is set to raise $28,000, which will be earmarked for recording; the mixing & mastering of the album at the prestigious Echo Mountain Recording Studios in Asheville; album packaging design; album pressing; distribution; publicity and radio promotion. Supporters will receive an assortment of special gifts for pledging to the campaign including a day at the studio w/ The Honeycutters; handwritten lyrics booklets to accompany the album; house concerts featuring The Honeycutters; an invitation to a either a guitar workshop w/ Peter James or a songwriting workshop w/ Amanda Anne Platt; a special edition poster; pre-release copies of the album; stickers; digital downloads and more. The Honeycutters are currently featured in CMT’s Concrete Country series where they perform three original songs live in the heart of Downtown Nashville. “With smart songs and a pleasant acoustic approach, the Honeycutters may become one of Americana’s next buzz bands,” said CMT Edge’s Craig Shelburne. Watch it here: http://www.cmtedge.com/2013/04/22/concrete-country-the-honeycutters/. 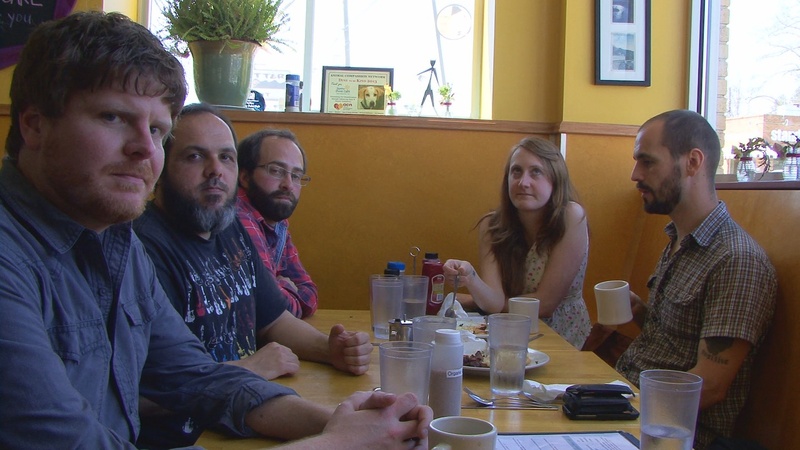 Last year marked a successful year for The Honeycutters, with the release of their second album, When Bitter Met Sweet, which was also fan funded. The album released at MerleFest and was one of the top ten selling albums at MerleFest 2012. The band went on to sell out the Grey Eagle in Asheville for their official CD release party, and they performed at Strawberry Music Fest in California. Highlights for the band in 2012 included opening for Guy Clark in Nashville, TN and for Jim Lauderdale in New York City. When Bitter Met Sweet remained on the Americana Radio Chart for 11 weeks after its June release where it reached #23. It landed at #94 in the top 100 Americana releases for 2012 and placed #4 in WNCW’s Top 100 Albums of the same year. Regionally, it was the #2 record, right behind The Avett Brothers’ The Carpenter. Asheville’s Mountain Xpress reader’s poll selected The Honeycutters as “Best Local Americana Country Band” for the second year running. The group’s first release, Irene (2009) also received positive accolades like placing #32 on WNCW’s Top 100 Chart and a listing on Iaan Hughes’ No Depression Podcast’s Top Twenty of 2009. For a free download of a sampler of The Honeycutters’ music, visit NoiseTrade: http://bit.ly/honeycuttersntm. Seated concert with limited tablets of 4 or 8 available with dinner reservations. There is also theater-style & balcony seating seating available on a first come first serve basis. CLICK to Visit The Honeycutters’ Kickstarter Site! Rorey Carroll is a singer songwriter sitting pretty between her Americana, folk and alternative country/bluegrass influences. “Roadside Lullabies”, her first album, was recorded by Eric Wilson and will be released at the end of September, 2010. The album was recorded Echo Mountain Studios and Omni Artists Productions; it was mastered at Crossroads Music, all in the Asheville, NC area. Rorey Carroll will be releasing “Roadside Lullabies” at MoDaddy’s bar in Asheville on Thursday, September 23rd. The show start at 9pm with the Honeycutters. Playing along with Carrol for the evening will be Rick Cooper- guitar, Aaron Ramsey- mandolin + banjo, Jess Smith- bass, and Zeb Bowles- fiddle. Rorey Carroll’s fiercely independent spirit is reflected in her songwriting, while her sweet voice resonates the soulful energy. She credits her parents for encouraging her personal expression in music and poetry at an early age. From her life experiences on foot, through the window of her car, to the bed of a freight train, Carroll has learned to use her guitar as a vehicle to tell a story. She got her first taste of wandering when she moved from the Midwest to Leadville, a small mining town in Colorado. Leadville exposed her to a different lifestyle. In a place where hitchhiking and living in a tent is the norm, Carroll lived hand to fist, out of a backpack, learning the skills that would take her around the country. Inspired by her new life, she picked up her guitar and started putting her poetry into music. From her first three chords, she wrote her first songs. At 20, she decided to walk the Appalachian Trail, from northern Georgia to Maine, with a good friend, a mean dog and a backpack friendly guitar. She fell in love with the older mountains and culture of Appalachia and settled into Asheville, NC after the trail. Immersing herself into an area of the country thick with amazing songwriters, musicians and inspiration, Carroll learned more about the art of songwriting and composition. She delved deeper into herself to create songs with love, angst and emotion. Carroll began to attract the attention of the music industry with her onstage performances throughout the South and at Desert Rocks in Moab, UT, singing her songs “Head Hung” and “Leaning on Lonely”, and “Golden Sky”. She has sold her self-released recordings through local festivals and music venues across the country.